Written by world-renowned and best-selling experts, Nobel Laureate E. J. Corey and Laszlo Kurti, Enantioselective Chemical Synthesis offers an authoritative and comprehensive overview of the field’s progress; the processes and tools for key formations; future development for complex, stereocontrolled (enantiomeric or diastereoisomeric) molecules; and valuable examples of multi-step syntheses. 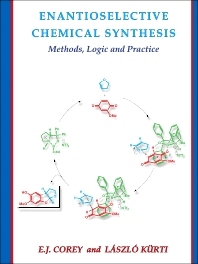 Utilizing a color-coded scheme to illustrate chemical transformations, Enantioselective Chemical Synthesis provides clear explanation and guidance through vital asymmetrical syntheses and insight into the next steps for the field. Researchers, professionals, and academics will benefit from this valuable, thorough, and unique resource. In Part I, the authors present clearly, comprehensively and concisely the most useful enantioselective processes available to synthetic chemists. Part II provides an extensive discussion of the most logical ways to apply these new enantioselective methods to the planning of syntheses of stereochemically complex molecules. This hitherto neglected area is essential for the advancement of enantioselective synthesis to a more rational and powerful level. E.J. Corey has been a Professor at Harvard University since 1959. He was educated at the Massachusetts Institute of Technology (1945-1950) and served as a faculty member at the University of Illinois from 1951-1959. He is the 1990 Nobel Laureate in Chemistry, and the recipient of over seventy international awards and honorary degrees, including the U.S. National Medal of Science, the Japan prize in Science, and the Priestley Medal of the American Chemical Society. He is a member of the U.S. National Academy of Sciences and the U.S. National Institute of Medicine. Professor Corey is the author of more than 1,000 publications and is one of the most cited authors in science. Laszlo Kurti is a faculty member in the Department of Biochemistry at UT Southwestern Medical Center in Dallas (http://kurtilabs.com). He received his diploma from the University of Debrecen, Hungary, where he conducted research in the laboratory of Professor Sandor Antus. Subsequently he received is MS degree at the University of Missouri-Columbia working with Professor Michael Harmata, and his Ph.D. degree (2006) in synthetic organic chemistry under the supervision of Professor Amos B. Smith III (the University of Pennsylvania). From 2006-2010, he was a Damon Runyon Cancel Fellow in the group of Professor E.J. Corey at Harvard University.